Aluminium alloys, their properties, treatments and uses. For specific data on these aluminium alloy grades please follow the links below. We are very grateful to our long standing aluminium metals supplier Aalco for giving us permission to use these data sheets to help illustrate the range of common commercial aluminium alloys, their properties and uses. Anodising changes the microscopic texture of the sheet metal surface and changes the crystal structure of the metal near that surface. 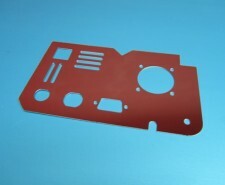 Thick anodise coatings are normally porous, so a sealing process is often needed to achieve a suitable corrosion resistance. 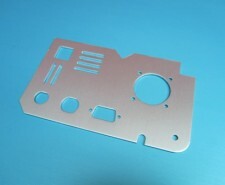 Anodised aluminium surfaces, for example, are harder than aluminium but have low to moderate wear resistance but this can be improved with increasing thickness or by applying suitable sealing substances. 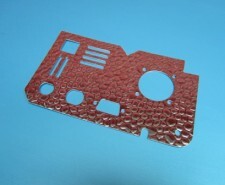 Anodic films are generally much stronger and more adherent to the sheet metal parent metal than most types of paint and metal plating, but they are also more brittle. This makes them less likely to crack and peel from ageing and general operational use. 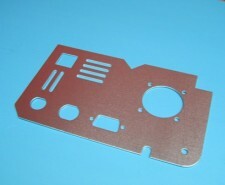 The surface finish can be left natural (silver) or dyed with a range of colours for decorative sheet metal work. Further data will be added to this page explaining the differences between Anodising, Alocrom and Iridite NCP and their uses on aluminium alloys with physical size limitations that can be offered by our supplers in Hampshire, Surrey and Dorset.